What ? ? ? Fruits Unable to Protect against Cancer ! ! ! Eating fresh fruit and vegetables will not protect you against cancer as it has little effect, a study finds. Official guidelines recommend at least five portions of fruit and vegetables a day in order to be healthy but new research has found that this may not have a substantial effect on cancer. The science suggests that people should be told that cancer risk is much more related to how much you eat and drink rather than what you eat. The review, published in the British Journal of Cancer, looks at a decade of evidence on the links between fruit and vegetables and the development of cancer, but it concludes that the evidence is still not convincing. But fruits and vegetables have other beneficial effects. They contain essential minerals and vitamins and are great source of them. 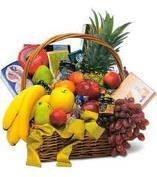 Fruit and vegetables have special place in the healthy diet chart. it is researched that fruits have little effect against fighting cancer only. but they definitely have health benefits. one should not discontinue their use. i have written this in he end of the article. Garlic has Allicin and many sulfur containing compounds which are very useful for protection and treatment of various cancers.